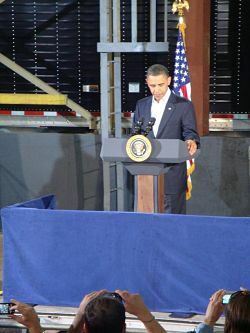 President Obama said in Macon today that his administration has the goal of tripling the production of biofuels in the United States in the next 12 years. That was of course well received by the group of workers at the Poet Biorefining Plant just outside of town. The President spoke for about 10 minutes at the plant, telling the 45 workers there that his administration is dedicated to making clean fuels a staple of the American economy in the immediate future. President Obama pointed to money in the recovery act that amounted to the largest investment in clean energy in US history. 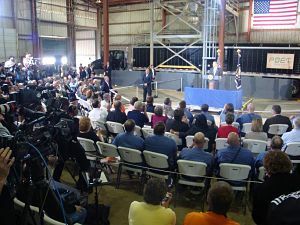 “It’s an investment we expect will create or save up to 700,000 jobs across America by the end of 2010. Jobs manufacturing next generation batteries for next generation vehicles. Jobs upgrading a stronger, smarter power grid. Jobs doubling the capacity to generate renewable energy from sun and wind and biofuels; just like you do here,” President Obama said. He says he has a goal to triple production of biofuel in 12 years, and has formed a ‘biofuel work group’ headed by Secretary Tom Vilsack, who was also in attendance in Macon. The President says the impact goes beyond the jobs biorefining creates, and even the money it means for agriculture. “We’ve grown actually more dependent on foreign oil every single year since Richard Nixon started talking about this danger of dependency on foreign oil. As we talked about it, other nations were acting. China, Spain; countries that recognized the country that leads the clean energy economy will be the country that leads the 21st century economy,” President Obama said. 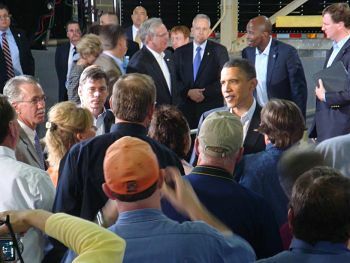 The President also took a tour of the Macon plant before his speech this afternoon. Poet’s CEO says he took advantage of the opportunity to have the President’s ear, telling him about the company’s hopes for production of new types of ethanol in the future, and what the federal government can do to help make that happen. “I’ve said before I won’t accept second place for the United States of America. I want us to be first in wind power, first in solar power, and I want us to be first when it comes to biodiesel and the technologies that are being developed in places like Poet. That’s why my energy security plan has been one of the top priorities in my administration since the day I took office.” President Obama said. Following the speech at Poet, the President made a visit to a local family farm that was not open to the media outside of the White House Press Corps.